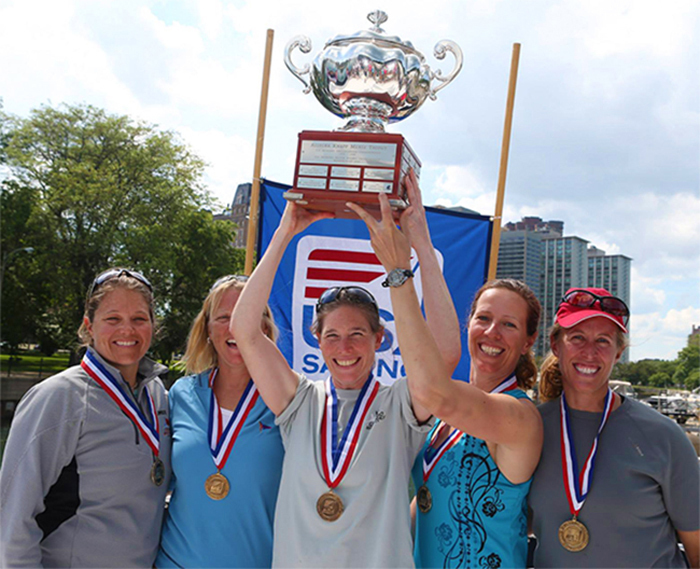 2013 USA Women’s Match Racing Champion Team! Congratulations Ladies! In a three-day series at the Chicago Match Race Center that featured everything from light shifty breeze to big wind and waves, Chicago-based Jennifer Wilson and her team of Sally Barkow (Nashotah, Wisconsin), Katherine Pettibone (Sacramento, California), Krista Paxton (Royal Oak, Michigan), and Sandi Svoboda (Grosse Pointe Park, Michigan) have won the Allegra Knapp Mertz Trophy for the 2013 US Women’s Match Racing Championship. After defeating Sandy Hayes in a 2-0 Semi-Final, Wilson and team went on to defeat Stephanie Roble and her team in a 3-1 Final. For winning this ISAF Grade 3 championship, Wilson will receive an automatic invitation to the Open US Match Racing Championship this September in Sheboygan, Wisconsin as well as the Women’s International Match Race Series event this July in Oyster Bay, New York.